It’s October and fall has officially arrived. It’s time to dive head first into everything and anything pumpkin, am I right? Sure, the Pumpkin Spice Lattes and candy corn are fun and festive, but do they actually contain any real pumpkin in them at all? The answer is likely no. This is why I’d like to share with you my Pumpkin Chia Seed Pudding, just in time for October Unprocessed. I am excited to participate in Andrew’s October Unprocessed challenge this year, eating clean and wholesome for one whole month. I tend to eat clean the majority of the time, hence my blog, Eat Real Food, and I encourage you to do so as well. But this challenge really brings mindful eating into play. So what does eating real food mean to me? Foods that are minimally processed and eaten in it’s purest form. For example, foods that contain artificial flavorings, preservatives or additives are definitely not clean. Unprocessed or “real foods” are not chemically derived or are unrecognizable. Don’t get me wrong, there are positives to some processing, such as bagged lettuce, cut up fruits/vegetables, fortified foods/beverages and whole wheat bread, etc. When you’re adding in a significant amount of salt, sugar, fat and ingredients you couldn’t make at home, that is not unprocessed. Artificial sweeteners are a big no for me. Do I want to feed my body with unknown substances/chemicals that we do not know the long-term side effects of yet? No thanks. Nuts and seeds are always great-unprocessed options. High in fiber and protein, they are sure to keep you feeling fuller longer. Chia seeds, the main star of this recipe, are filled with Omega 3 Fatty Acids – essential “good” fats that your body does not produce on its own. Omega 3s can lower blood triglycerides (which may help prevent heart disease), contains anti-inflammatory properties and many more health benefits to boot. Chia seeds also contain essential minerals, including calcium, iron, phosphorus and magnesium. They may be small in size, but they pack a huge nutritional punch! I decided to top my pudding with some heart-healthy walnuts and pumpkin seeds for added nutrition and extra crunch. 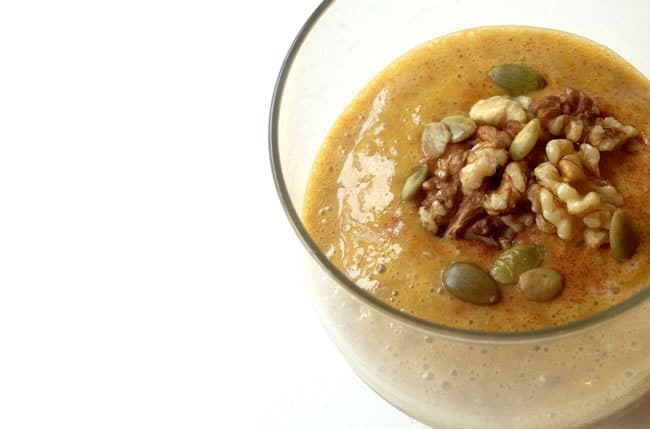 This Pumpkin Chia Seed Pudding is great for breakfast or dessert. I hope you enjoy! Chia seeds contain essential minerals, including calcium, iron, phosphorus and magnesium. They may be small in size, but they pack a huge nutritional punch! Combine almond milk, pumpkin, chia seeds, maple syrup, and pumpkin pie spice in a bowl. Stir until well mixed. Refrigerate for at least one hour, or overnight is best. 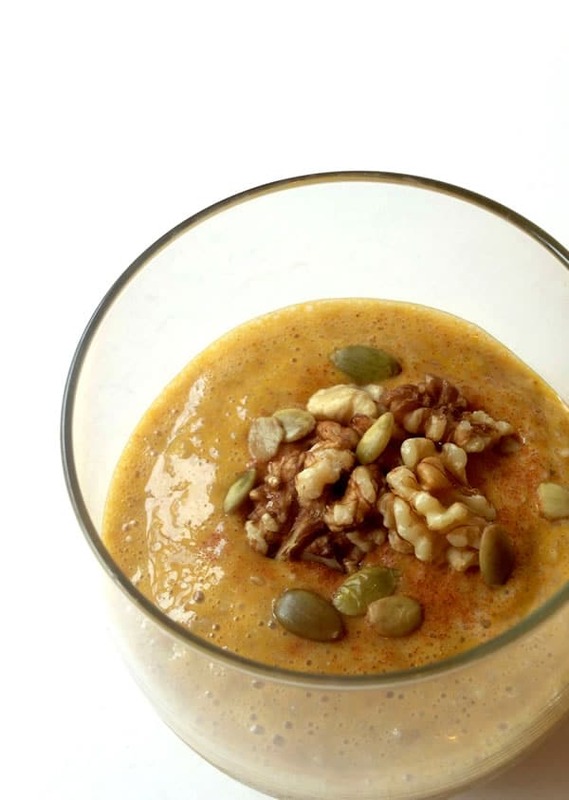 Spoon pudding into serving glass and top with a sprinkle of cinnamon, walnuts, and pumpkin seeds to garnish. Alanna Waldron is a Registered Dietitian based in Los Angeles, CA. She is the author of Eat Real Food, a health and fitness blog that encourages others to live a healthy lifestyle through wholesome foods. You can find Alanna on Instagram, Twitter, and Pinterest. Looks fabulous! I love that you used almond milk instead of coconut milk which it seems like everyone uses for chia puddings! Thanks! Almond milk is a staple for me. My digestive system can only handle so much coconut! Could you use rice milk or soy milk for this? My daughter has an almond allergy. Yes, any milk or milk alternative would work out just fine. Do you make your own almond milk or buy store bought? I’m considering store bought almond milk processed so interested to hear your take on it. Thank you! Can’t wait to try this! I’ve been enjoying organic oat milk as my plant milk of choice, it contains no carrageenan (which can irritate your stomach) or other additives – it’s creamier than rice milk too. Oat milk sounds delicious, will have to try it! Yes, please avoid carrageenan at all costs. Thank you! This recipe came just in time. It was hard to walk through Trader Joe’s yesterday and see so much pumpkin knowing that I won’t be eating any of it. I did however buy two cans of pumpkin and will be making this recipe tonight. You are very welcome! Hope you like it!